5 out of 5 stars - New 2018 Men's Cobra F8 Hybrid - RH - Nardo Gray - Choose Your Loft and Flex! 1 product rating1 product ratings - New 2018 Men's Cobra F8 Hybrid - RH - Nardo Gray - Choose Your Loft and Flex! Rest assured that you are getting an Authentic Product. Excellent Condition The club has a factory Project X Hzrdus Black 62g 6.0 - Stiff flex Graphite shaft and has a Cobra Grip with Arccos. (drivers, fairway woods, hybrids, single irons, wedges, putters. ). Cobra Bio Cell Plus 3 Driving Iron - Dynamic Gold AMT S300 - Right Handed. Head is still in plastic, the shaft was pulled out of a brand new Mizuno Hi Fli Driving Iron and is also new. There was some epoxy in the backside of the ferrule and it was lightly sanded to remove, which you can see. Shipped with USPS Priority Mail. Cobra King Utility Black One-length 3-iron. Shaft is 37.5” and plays to 7-iron length. Club is used with the head, shaft and grip in great condition. The club does have an adjustable loft hosel but I don’t have the wrench for it. Cobra King Utility 3 iron golf club. used by scratch golfer, condition is 7 out of 10. Lamkin crossline standard grip with Cobra Connect sensor. Standard length of 7 iron. Adjustable loft 2-3 Iron. Condition is Used - Excellent condition. Excellent Condition The club has a factory Project X Hzrdus Yellow 63g 6.5 - EXTRA Stiff flex Graphite shaft and has a Cobra Grip with Arccos. 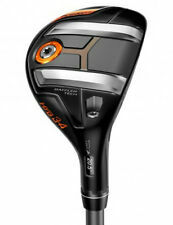 (drivers, fairway woods, hybrids, single irons, wedges, putters. ). This is a set of pre-owned King Cobra S Oversize Irons. Includes from 3 Iron to Pitching Wedge. They are in nice clean condition. There is one label on one of the clubs that says S Firm Flex. Shafts are steel. EGK VOLT BLACK RUBBER GRIP IN LADIES SIZE. ASSEMBLED WITH A LADIES FLEX VELOCITY PINK GRAPHITE SHAFT. 3,4,5,6,7,8,9,PW. Standard length and lie with factory original stiff flex steel shafts. Cobra Bio Cell 3 Iron - 18 degrees of loft condition is nice - used lightly. Left Handed Tour AD MJ 7X (X-Stiff) Shaft Length is 39.5” inches Grip is Golf Pride Tour Velvet standard grip Shipped Free with USPS Priority Mail. Cobra Bio Cell 3 Iron - 20 degrees of loft. Left Handed. KBS C-Taper Lite 115 X-flex shaft. Iron set is in good condition just light wear on face area. Dynamic Gold S300 Stiff Flex. King COBRA Carbon CB Forged #3 Iron. Cobra Rubber Grip. IT HAS A FIRM FLEX COBRA GRAPHITE SHAFT AND A BLACK COBRA GRIP. THIS IS A GREAT CLUB FOR THE MONEY! 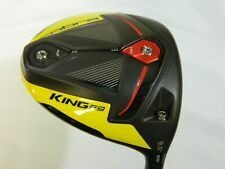 Cobra King F7 Hybrid 3-4 Hybrid Senior RH Lite New Headcover. Condition is New. Shipped with USPS Priority Mail. Trending at $103.96eBay determines this price through a machine learned model of the product's sale prices within the last 90 days. Fairway Woods. Cobra S3 Iron Set 4-PW Cobra Aldila NV-3 Graphite Regular Right Handed 38.5 in. 2nd Swing Minnetonka is 1 of only 3 Studio B Fitting Studios in the country. Cobra Aldila NV-3. 72 P.S. Â§ 7213.2. Shafts - Original Aldila NV-3 60 Lite Flex (Seniors) Graphite. Irons - 23 4H, 26 5H, 29 6H, 7, 8, 9, Pitching Wedge, Sand Wedge. This set is in average used condition with wear from typical use. UST RECOIL ES 780 SMACWRAP GRAPHITE SHAFT - REGULAR FLEX. COBRA KING UTILITY BLACK IRON. LAMKIN ACE CROSSLINE CONNECT GRIP. ADJUSTABLE: 21-24 DEGREES. Shaft: King Cobra Graphite Regular Flex. Grip: Original Cobra Golf Pride Wrap Style. Dexterity: RH. You are receiving the exact club pictured. Length: 39". These clubs are still in very good shape. This is the easiest to hit utility iron on the market. The cobra utility iron is the first Corbautility iron with adjustable life settings from cobra. The loft can range from 18° to 21°. This utility are and comes with an Oban Kiyoshi purple shaft. It is O5 X flex 100grams. This is a ball strikers driving. Buy with confidence I’m a PGA professional. Fairway Woods. 72 P.S. § 7213.2. 2nd Swing Minnetonka is 1 of only 3 Studio B Fitting Studios in the country. Individual Irons. Head Covers. 2012 and 2013 Cobra Fitter of the Year - Minnesota. We cannot change amounts for declared value. COBRA BIO CELL 3-4 HYBRID LEFT HAND GRAPHITE STIFF FLEX NICE USED CLUB! Cobra Bio Cell. Stiff Flex 63g. Graphite shaft. Cobra Lamkin grip. 3-4 HYBRID. Very Easy to hit club! Clubs is nice used condition.